Clock Generator, used on Commodore 64 mainboard 250425-01 and newer. This Chip replaces Chip U29, U30, U31 and U32 from earlier boards. 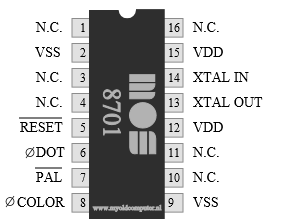 The chip creates the Color and Dot clock by dividing the Xtal input.